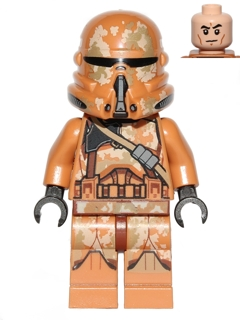 The Geonosis Airborne Clone Trooper is a Star Wars Episode II - Attack of the Clones minifigure introduced in 2015. The Geonosis Airborne Clone Trooper's legs are Medium Nougat with a brown hip joint and features printing for the clone trooper's armour, including a dark tan left kneepad, and a tan and dark tan camouflage pattern on each leg above the kneepads and on the top part of the leg joint. The trooper's body is again medium nougat to represent the primary colour of the armour, and features printing on both sides, including black for detailing and outlining. The tan and dark tan camouflage pattern is again present on the trooper's body on the top armour plates. Additionally, two bandanas are printed on both sides- a dark tan one running diagonally over the left shoulder which also features three dark grey ammunition packs on the front, and a brown strap running vertically over the left shoulder and attaching to the belt on either side. A ridged belt is present on the bottom of the front of the piece, while a thermal detonator clipped to the belt is present on the back. Black hands are used for this clone trooper, with medium nougat arms. The Geonosis Airborne Clone Trooper's head piece is new and first included in three of the four 2015 battle packs. It features a flesh-coloured piece with black dot-eyes, facial outlining, eyebrows with the left eyebrow slightly raised, giving an overall calm expression. This minifigure comes with two accessories- a helmet and a blaster. The helmet is a mould first used on the original Airborne Clone Trooper, which was made to better reflect the armour used for clone troopers who regularly made high altitude drops in the Star Wars universe. Instead of the traditional "T"-shaped visor, black printing is used for a thin horizontal visor, as well as for areas below, including the enlarged beather in the mouth area which also has grey printing in the centre. The tan and dark tan camouflage pattern is also present on this piece in the upper face area. The blaster is a black stud shooter with a dark stone grey trigger, which can fire transparent blue studs. Clone airborne troopers, also known as clone paratroopers, were clone troopers who were specially trained for high-altitude drops. Geonosis Clone Troopers were the clone troopers deployed during the Battle of Geonosis, the first battle of the Clone Wars. This is a description taken from LEGO.com. Please do not modify it. (visit this item's product page) With special armor and equipment for descending through the atmosphere of hostile planets like Geonosis, airborne clone troopers have been the key to many Republic victories. Facts about "Geonosis Airborne Clone Trooper"
This page was last edited on 29 September 2016, at 21:50.